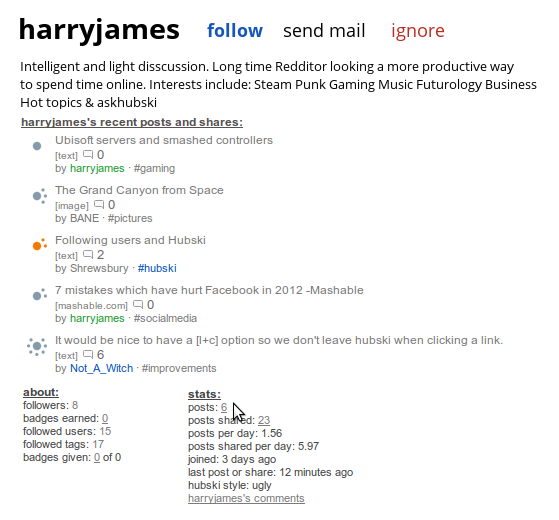 I like the idea that you follow users, rather than tags on Hubski. However, this does not really come across in this website's design. I know this is a pretty new site, and a lot of the details have yet to be worked out, but a few things could be done to emphasise Hubski's "user-centrism". First is by switching around a little bit of the terminology. There's a nice big "submit a post" button. But that feels very "reddit". You could change the text to something more along the lines of "share something", making it a little less like posting in a forum, but without discouraging people. I would also make user profiles a little more "full fat". When you click on a username, in the popup window, the actual username is shifted off to the right of the page. It's very easy to blank out when looking at a profile. It causes a sort of disconnect between the content and the person, and doesn't encourage me to follow anyone. However, I would NOT change the look of tag profiles. The fact that they aren't particularly inspiring helps this user-centrism concept. Anyway, I'm rambling a bit, and I can't think of anything else right now, so I'll stop. EDIT: Now I've posted my first proper item, another suggestion I would make is to put a user's newest post at the top, and have it move around the page based on time and "hotness". It's a bit ego-stroking, which is exactly why I suggest it. Thanks for the feedback, Shrewsbury. It's helpful to get fresh eyes on the site, as it is difficult for us to see the site from a new user perspective. I take to heart the impression that the focus upon following users doesn't come through strong enough. That is definitely going to influence my design decisions going forward. In the recent influx of users there has been a lot of focus upon tags, and I think that suggests that your impression is right. I'm happy you took my suggestions on board, and I'm looking forward to seeing what you come up with! First is by switching around a little bit of the terminology. There's a nice big "submit a post" button. But that feels very "Reddit". You could change the text to something more along the lines of "share something" Share something sounds very similar to submit a post, although I can see where you are coming from. I would also make user profiles a little more "full fat". I kinda like the way they are now, it shows some of the profile while keeping the site in the background to make it sort of a pop-up look. Another suggestion I would make is to put a user's newest post at the top, and have it move around the page based on time and "hotness". Assuming they are based with the best things at the top, I would recommend keeping it that way, I personally would rather see a users best work as opposed to their newest. My reason for joining Hubski was elements of Reddit and Twitter. There just seems to be hashtags rather than subreddits and the abiity to follow users. I feel like there definitly needs to be more emphasis on a users profile page. The pop up idea is good, for not dragging you away from a thread, but I don't feel like I have seen anything about a person, only a bio if they have written. Have you ever seen the cloud thingies which convert your Facebook words into proportional bubbles? A proportional representation of shared posts from which hashtags wouldn't go amiss, as I don't really know what I am in for when I subscribe to somebody. Harry, you make some valid points. Content discovery as well as ways to show user stats/interests are areas we plan on focusing our attention. Thanks for the suggestions. As you be one more familiar with the site, please continue to provide feedback. We are definitely listening. Cheers! I kinda like the way they are now, it shows some of the profile while keeping the site in the background to make it sort of a pop-up look. I haven't removed anything from the page, just moved things around a bit. Assuming they are based with the best things at the top, I would recommend keeping it that way, I personally would rather see a users best work as opposed to their newest. It's not quite what I meant, but the more I look at it, the more I think it's a bad idea anyway, so disregard that. 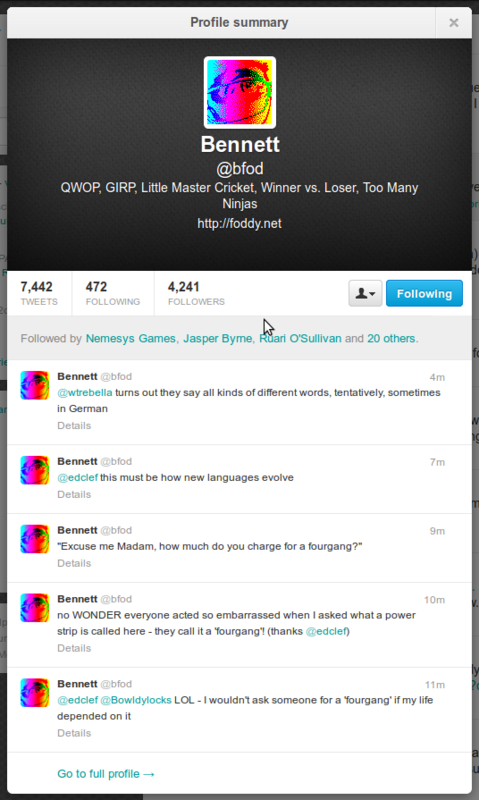 You guys can set quotes apart by putting the text in between vertical bars (shift+backslash). See the markup button next to your posts. If you are purposely not doing that for some reason, ignore me. Actually, I didn't notice that in the markup documentation, so thanks for pointing that out.